For 60 years, the engineers at teutonia have been dedicated to building some of Germany’s finest strollers. Now you have the ability to design your own teutonia to reflect your unique lifestyle. Quality and performance is assured with teutonia’s 3-year warranty. 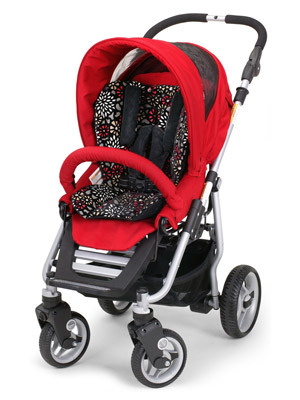 The t-100 series is the lightest and trimmest teutonia chassis and the stroller seat will hold a child up to 50 lbs. Pictured here is the t-160 chassis (which includes the metro 60 wheels), t-stroller seat in venetian red and kingston black t-duo cushion. Click here to enter to win the complete teutonia stroller! And, be sure to come back NEXT Monday to see what you could win in our next giveaway! Online entries must be received between 12:00 a.m. Eastern Time (”ET”) on 7/20/09 and 11:59 p.m. (ET) on 7/26/09. See Official Rules. Also check out Bellaziza’s Favorite Things — they’re giving away another teutonia model, and you could win!